Your network contains an Active Directory forest named contoso.com. The forest contains a single domain. All servers runs Windows Server 2012 R2.The domain contains two domain controllers named DC1 and DC2. Both domain controllers are virtual machines on a HyperV host. You plan to create a cloned domain controller named DC3 from an image of DC1. You need to ensure that you can clone DC1. Which two actions should you perform? (Each correct answer presents part of the solution. A: Cloneable Domain Controllers Group There's a new group in town. It's called Cloneable Domain Controllers and you can find it in the Users container. Membership in this group dictates whether a DC can or cannot be cloned. This group has some permissions set on the domain head that should not be removed. Removing these permissions will cause cloning to fail. Also, as a best practice, DCs shouldn't be added to the group until you plan to clone and DCs should be removed from the group once cloning is complete. Cloned DCs will also end up in the Cloneable Domain Controllers group. There's one key difference between a cloned DC and a DC that is being restored to a previous snapshot: DCCloneConfig.XML. Your network contains an Active Directory domain named contoso.com. The domain contains a server named Server that runs Windows Server 2012 R2. 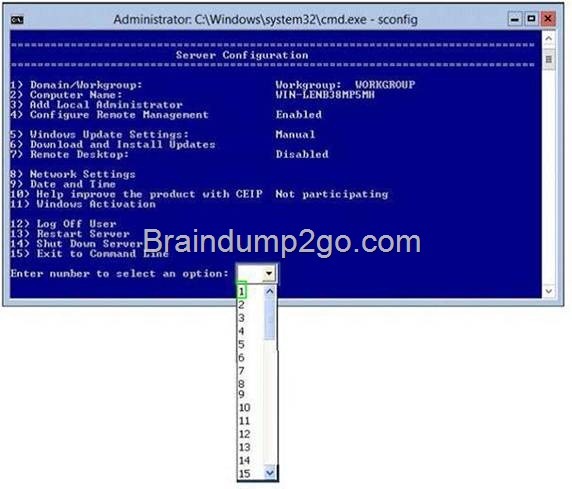 You perform a Server Core Installation of Windows Server 2012 R2 on a new server. You need to ensure that you can add the new server to Server Manager on Server1. What should you configure on the new server?To answer, select the appropriate setting in the answer area. You have been instructed to modify the name of the local Administrator account on all L2P.com workstations. You want to achieve this using as little administrative effort as possible. D. You should consider navigating to Local Users and Groups via Computer Management on each workstation.